Stunning: Shimmering gold glitter finish premium grade cardstock with cutout of “Just Born” and numbers 1 to 12. Great Gift: Handmade and beautifully packed. Can also be used as a thoughtful baby shower gift. Big Bundle: Packed with 8 feet luxurious satin ribbon in bronze gold with plenty of excess for all landscape/portrait 4x6 4R photos, 4 strands of 21” organza ribbon as additional ornaments, and natural wooden clothespins. 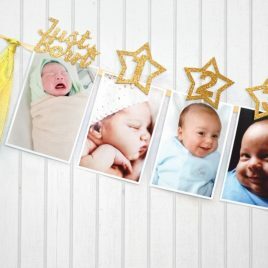 Decorative: With long-lasting glittered high quality durable cardstock, you can savor the precious memories by using them for display during and after a birthday party. Easy DIY: Props are cut out in shapes. ASSEMBLY IS REQUIRED. Package includes ribbons, clothespin/pegs with adhesive pad. 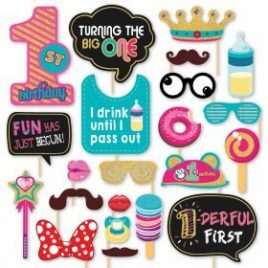 Big Bundle: 4 pieces of double-sided chalkboard cards measuring 8.3” × 11.7” each (A4 size), one “Strike a Pose” sign measuring 10” x 14”, 15 pcs cut-out props, and 14 pcs of 9” straws included. Let your guests get creative! 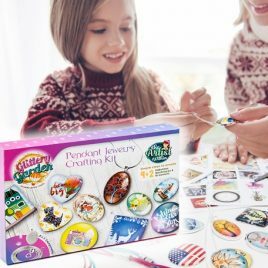 PERFECT GIFT: A complete jewelry crafting kit that brings fun, style and fashion to any creative crafters! Promote creativity skills by learning glass pendant and bracelet making techniques using the cheerful color knotting cords. Work great for developing kids’ imagination, creativity, finger dexterity and hand-eye coordination. GREAT FOR ANY OCCASION: A fun activity for parties and special occasions! You can have a spectacular sleepover, breathtaking birthday party or just a glamorous girl’s night in. Keep adults, teens and any kids above age 8 busy and entertained for hours! EASY WAY TO CRAFT a handmade Christmas/birthday/Valentine’s gift and put a smile on your closest friends and family. Create a one-of-a kind necklace or bracelet to remind someone they are loved. Add charms and beads to your creation to make it even more special. THOUGHTFULLY CURATED: 200+ Free vibrant colors and beautiful images and patterns pre-printed to fit pendants of various shapes – oval, round, square and hearts. Printed templates are also included to create your own masterpieces through drawing/coloring/glitter. Premium quality accessories such as silver plated necklaces and long lasting bracelet cords guarantee professional and impressive results. BIG BUNDLE: Get all the supplies you need to personalize and customize a unique gift. Kit includes 11 pendant trays, 11 clear glass cabochons, 4 beads, 5 silver plated necklace chains, 4 string necklaces, 1.75 yard knotting cord to make 2 bracelets, craft glue, and a booklet that comes with clear instructional guides and collage image sheets, all beautifully packed in a box. Attention-Grabbing: Stunning and reflective gold glitter finish on premium grade card stock. Great Gift: Beautifully packed in a box. Can also be used as a thoughtful birthday gift. Big Bundle: 22 props with vibrant colors, including chalkboards and a bib featuring playful phrases. Let your guests get creative! Decorative: With long-lasting bright color lamination on high quality durable card stock, you can savor the precious memories by using them for display during and after the party. Easy DIY: Props are printed and cut out. Package includes flat surface wooden sticks and double-sided sticky pads (cut to size). Wand, candy and macaroons props are designed to be easy to hold (no sticks required). 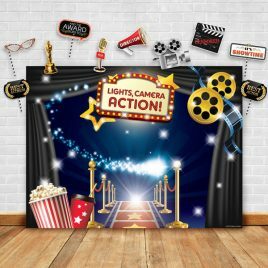 FUN & ENTERTAINING: Great for Hollywood-themed, dress-up, movie night, red carpet, or vintage themed parties - instantly liven up your party setting. Let your guests get creative! EXQUISITE PACK: Vibrant silk screen non-glare printing backdrop on 100% knitted polyester fabric measures 4.5*6 feet, for both outdoor and indoor use. 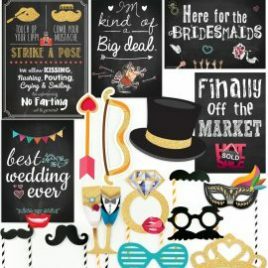 DECORATIVE: Long-lasting bright color photo booth props cutouts printed with matte lamination on durable card stock. VERSATILE: Can be used as tablecloth, wallpaper, curtain, backdrop for photo studio, play house, playroom and any club event. Savor the precious memories by using them for display during and after a party. EASY DIY: Props are printed and cut out. 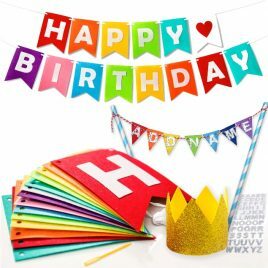 Package includes striped straws, double-sided sticky pads (cut to size) and acrylic adhesive tape for wall hanging backdrop. ASSEMBLY IS REQUIRED. Ships folded, ironing is required to remove folding lines. 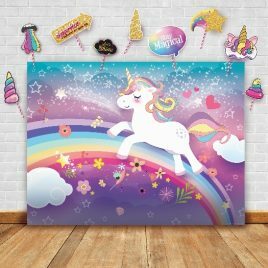 FUN & ENTERTAINING: Great for dress-up, fairy tales, princess, rainbow and unicorn-themed parties - instantly liven up your party setting. Let your guests get creative! 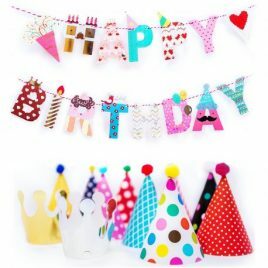 This gorgeous felt birthday banner will make your birthday party a very special one! The vibrant color of the rainbow-tone flags will lighten up your party venue effortlessly. Made from high quality felt, the banner can be used both indoors and outdoors. It is durable and reusable, so plan your garden party right away! Just remember - the star of the party is to be treated like royalty! We hope the party décor will help you create amazing memories that will last a lifetime. We'd be so thrilled if you could share some photos with us in your review :) ALL Glittery Garden branded products include our quality and authenticity guarantee. Your satisfaction is guaranteed or else you'll have your money back! 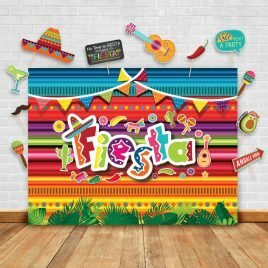 FUN & ENTERTAINING: Great for Mexican fiesta themed, carnival, dress-up, summer pool party, or tropical beach parties - instantly liven up your party setting. Let your guests get creative! EASY DIY: Props are printed and cut out. Package includes flat surface wooden sticks, double-sided sticky pads (cut to size) and acrylic adhesive tape for wall hanging backdrop. ASSEMBLY IS REQUIRED. Ships folded, ironing is required to remove folding lines. 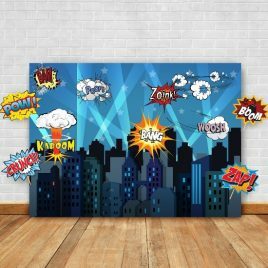 FUN & ENTERTAINING: Great for dress-up, halloween, Hollywood and superhero-themed parties - instantly liven up your party setting. Let your guests get creative! EXQUISITE PACK: Vibrant silk screen non-glare printing backdrop on 100% knitted polyester fabric measures 4*5.5 feet, for both outdoor and indoor use. DECORATIVE: Long-lasting bright color superhero word cutouts printed with matte lamination on durable card stock. Each prop measures approximately 8*11 inches.